We've done two big improvements to the reporting section over the past couple of weeks. Reports, data exports, etc. are very important to us, and we try to continuously improve them. If you've got any ideas, or a report that you think would be cool, shoot us an email or post on the forums. A common request is to be able to compare what happened this year with what happened last year, to see what movement was made and in what direction. For example, were bookings up or down, year over year, for a given month? We've added a new feature that lets you compare periods on every summary report (Bookings, Payments, Booking Stats, Occupancy). Notice how Dec 2015 is compared with Dec 2014, etc. You can also switch to showing absolute values vs. relative percentage changes. 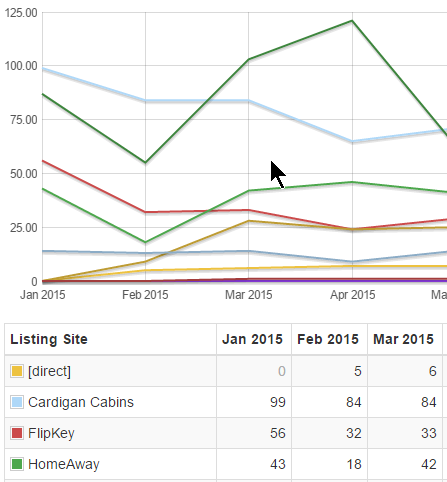 We've had the listing sites report for awhile. That's good to get an overall idea of what listing sites are sending the most inquiries, or converting the best, but it doesn't give a good feel of what happens over time, month to month or year over year. Enter the inquiry/booking volume report. This tracks inquiries or bookings by listing site over time, allowing you to see if listing changes are increasing or decreasing your inquiry volume. This report is also enabled for compare with previous period. This is awesome. One idea to make it even more useful would be to do a cumulative total comparison at the bottom of the report.... e.g. 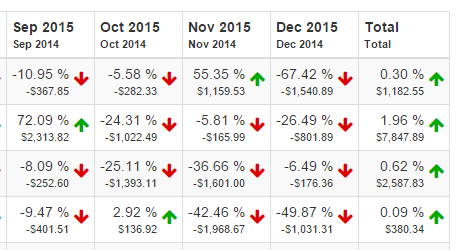 compare total revenue month over month to previous year.